The scaffolding that holds the large-scale structure of the universe constitutes galaxies, dark matter and gas (from which stars are forming), organized in complex networks known as the cosmic web. This network comprises dense regions known as galaxy clusters and groups that are woven together through thread-like structures known as filaments. 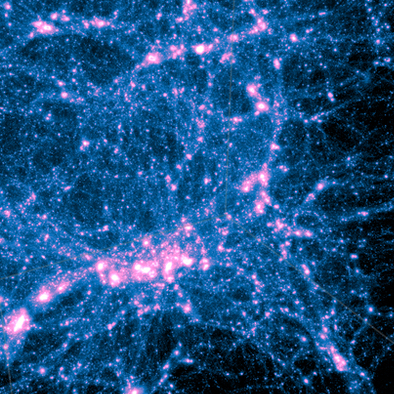 These filaments form the backbone of the cosmic web and host a large fraction of the mass in the universe, as well as sites of star formation activity (Figure 1). While there is ample evidence that environments shape and direct the evolution of galaxies, it is not clear how galaxies behave in the larger, global cosmic web and in particular in the more extended environment of filaments. In a joint collaboration between the California Institute of Technology (Caltech) and the University of California, Riverside (UCR), astronomers have performed an extensive study of the properties of galaxies within filaments formed at different times during the age of the Universe. In this new study, astronomers used a sample of 40,000 galaxies in the COSMOS field, a large and contiguous patch of sky with deep enough data to look at galaxies very far away, and with accurate distance measurements to individual galaxies. The large area covered by COSMOS allowed sampling volumes of different densities within the cosmic web. Using techniques developed to identify the large-scale structures, they cataloged the cosmic web to its components: clusters, filaments, and sparse regions devoid of any object, extending into the Universe as it was 8 billion years ago (Figure 2). The galaxies were then divided into those that are central to their local environment the center of gravity) and those that roam around in their host environments (satellites). “What makes this study unique is the observation of thousands of galaxies in different filaments spanning a significant fraction of the age of the Universe” quoted Dr. Behnam Darvish from Caltech, the lead author on the paper. “When we consider the distant universe, we look back in time to when the cosmic web and filaments were younger and had not yet fully evolved and therefore, could study the joint evolution of the large scale structures and galaxies associated with them”, explained Darvish. They measured the star formation activity in galaxies located in different environments. “It was reassuring when we found that the average star-formation activity declined from the sparsely populated regions of the cosmic web to mildly populated filaments and dense clusters. However, the surprising finding was that the decline was especially steep for satellite galaxies” said Bahram Mobasher, Professor of Physics and Astronomy at the University of California, Riverside. “The inevitable conclusion from this was that the majority of satellite galaxies stop forming stars relatively fast during the last 5 billion years as they fall to dense environments of clusters by way of the filaments, while this process is much slower for central galaxies” Mobasher emphasized. The fast cessation of star formation experienced by satellite galaxies can be explained by ram-pressure stripping, which is loss of star-forming gas within a galaxy as it moves within a denser environment, such as a cluster . “Compared to the central galaxies, it is the smaller gravitational pull of the satellite galaxies produced by their smaller mass, that results in a more efficient loss of gas and hence, a slow-down in star formation activity with respect to the more massive central galaxies” explained Chris Martin, Professor of Astronomy at Caltech. This study includes scientist from Caltech (Dr. Behnam Darvish, Prof. Christopher Martin, Prof. Nick Scoville, Dr. Shoubaneh Hemmati), University of California, Riverside (Prof. Bahram Mobasher), Lancaster University (Prof. David Sobral), European Southern Observatory (Dr. Andra Stroe), and Rochester Institute of Technology (Prof. Jeyhan Kartaltepe). The study is funded by NASA and the results are published in the Astrophysical Journal. Figure 1: Shows simulations of the cosmic web. The filaments connecting structures are shown. Such structures are predicted by numerical simulations of matter distribution in the Universe at different times through the age of the Universe. Figure 2: Observational data in the COSMOS survey shows filamentary structures at different redshifts (look-back times). At higher redshifts, galaxies become younger and one could look at the newly formed structures. Astronomers studied the evolution of these structures (mainly filaments) with cosmic time.